Who the hell is Ros Kaspi and why did she use an image of my Home Office for an article about online entrepreneurs on one of her websites? Let’s dig a little deeper into this and uncover the ethical implications of copyright infringement as conducted by someone who is affiliated with what many people, including lawyers, are describing as a total scam and illegal business model. But let’s start with a screen grab of the article that was on her site prior to getting in trouble with me after the disovery. The first thing to take note of is the domain that the website runs on which is called itpaysyoutoplayblog.com. Maybe it’s just me but with domain names like that the sense of it being some kind of financial scam comes to mind. The About page of the site doesn’t even have any content so the owner and author of the site, which was identified as Ros Kaspi (Rosalyn Kaspi) probably didn’t want to provide any information there. The second thing to notice is that the article “Online Opportunities for Entrepreneurs” contained an image of my Home Office (in its previous setup) and associated me and my business activities with the content of the article. That, dear readers, is certainly the quickest way to get me to rain down lawyers on you. Additionally some amounts of money are mentioned including various names of people like Richard Sears, Alvah Roebuck and companies such as Sears. None of those names or companies have anything to do with me or vice versa and certainly have nothing to do with the image of my Home Office. with this site of hers. A search was started to find Ros Kaspi. One of the first things discovered was a phone number and a traveltvi4pay domain and the fact that Ros Kaspi speaks for a company called Travel Ventures International (she signs her communications with that company name). The company appears to provide “online travel discounts” of some sort and a quick search into TVI revealed a lot of material on many different websites claiming that TVI is a total scam, including an attorney explaining why TVI Express is not legal in the US or Canada. Who’s Ros Kaspi, you ask? Kaspi is half of the moronic duo who had been publishing increasingly hallucinatory entries about TVI Express, passing on messages from their uplines that made absolutely no sense at all. Kaspi and Jackson, who runs a TVI Express member website called IncreaseMyMonthlyIncome. They’ve published some crazy claims before, such as claiming a TVI Express convention in the Florida, US in 3 months even though TVI Express has no announcement doing so. Today, they released even MORE unconfirmed information, which is just… idiotic. Darren Aikens TVI Presidential in the United States today had a webinar with quest speaker Aknon, who is the current TVI Express Barrister of Marketing. Do they even know what a “barrister” is? A barrister is what the Brits call a LAWYER or attorney. What the **** is a “lawyer of marketing”? What sort of a lawyer is he that won’t even give his full name? And where does he practice law? India? VP of marketing or president of marketing, I can believe. LAWYER OF MARKETING? Are they kidding me!?!?!?! But what’s even more interesting is the fact that Kasey writes about Travel Ventures International (TVI) HAVING STOLEN ANOTHER IMAGE. You can see the images and the alleged infringement on Kasey’s site. Back in October 2010, Darren Aikens, another “presidential” TVI Express distributor, was supposedly Kaspi and Jackson’s upline, and claims to have talked to Tarun Trikha and a new “barrister of marketing” Aknon and relayed exciting news. Mind you, this is AFTER TVINorthAmerica got the Cease and Desist from State of Georgia. So what you got here is a lie (by TROYSHELL) to “improve” a lie (by Kaspi and Jackson), about yet another lie, about a company that was founded on lies. It should be obvious that all this doesn’t indicate anything good about whatever Ros Kaspi is involved in but certainly shows that affiliating themselves with others (or vice versa), without permission, is just part of how Ros Kaspi wishes to conduct her “business”. That is, until real legal crap managed to hit the fan, of course. Luckily it doesn’t take a rocket scientist to find the location of Rosalyn Kaspi (Chicago, Illinois, USA) and thanks to her avatar images used on many other sites like LinkedIn it was easy to find a trail of other sites using the same avatars which eventually led to an e-mail address at comcast.com. It then didn’t take too long to settle the matter!! If you’ve never heard of Transworld International Youth Organization welcome to the club. I sure never heard of them. Until now, that is. What you see here is a grab of the “contact us” page of this organization which I assume now can confirm must be is some kind of scam. Why else would a real organization use a picture of MY office on their “contact us” page, implying it’s their “head office”? The address listed for Transworld International Youth Organization (TIYO?) is Brunham Road, FT. Smith, Arkansas, United States of America. There is very little you can find about this organization but if you search for the name of their secretary, supposedly a person going by the name of Professor William Kim Higgins, you will find this particular e-mail (from 2003) where the person posting the e-mail asks whether this is a scam or not. Looking at the rest of the website it just looks like a total scam revolving around global relief re-construction and some kind of vague conference. Note that the main site also has an alternate main page that’s linked from elsewhere in the site. I don’t know what kind of fraud ring this organization or the (probably fake) Prof. William Kim Higgins is running but it sure looks like it’s nothing good and the website does not inspire me with confidence. In fact, the text and content on the site just seems to scream “this is a total scam” as far as I can tell. If you know more about this, please let me know of leave a comment here. Addition: Some additional information can also be found here. 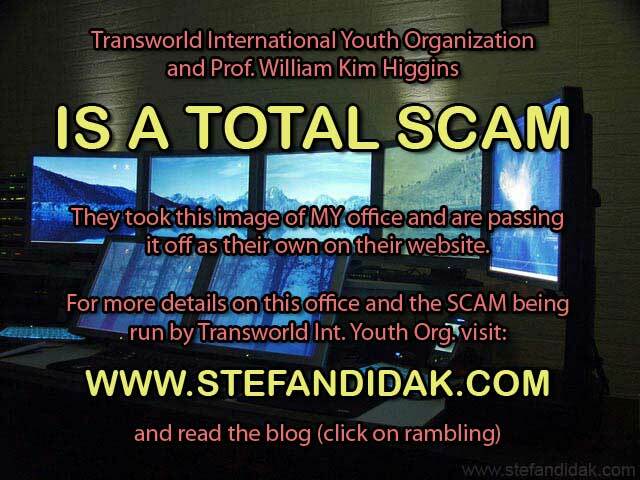 This link features a warning about a scam called International Youth Org. Saying that an e-mail from one Secretary General, Madam Cynthia Brady is floating around. This particular Transworld Youth Organization uses the address of No 157 West 47th Street, New York, NY 10036. Another addition: A website called Fraud Watchers also has some info on this scam. It appears the scam attempts to get your name, date of birth, place of birth, passport numbers, country code number, etc. information from you. For what is likely to be nefarious purposes. Update April 4th, 2009: The scammers have killed their site. After exposing them in my post and updating an image on their site it only took them a week to discover the game was over. They had not just taken one of my office images, they linked directly to it. I modified that image so everyone visiting the website of these scammers showed THIS image. I expected they’d notice that sooner or later and take the image off. Instead, they just deleted their entire site (which was hosted by FreeServers).